Angular velocity specifies rotational speed. Specifically, it is the rate of change of angular displacement and is a vector quantity (more precisely, a pseudovector) which specifies the angular speed (rotational speed) of an object and the axis about which the object is rotating. You may be wondering what does physics have to do with socks. The cables rotate around the leg, and they're a little angular. This may only make sense to me, and I'm OK with that. The cables, inspired by an Alpine stitch dictionary that found its way into my house, may look intimidating, but really they're not. After a few rounds, you'll see that they always move in the same direction. 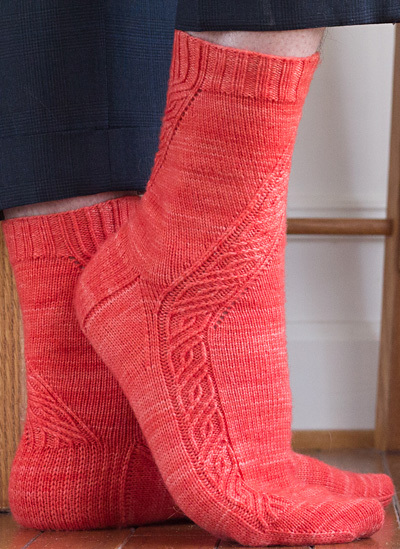 With a few yarn overs and stockinette between the cables, these socks can work up pretty quickly. T2L – Sl next st to cn and hold in front of work; k1 tbl, then k1 tbl from cn. T2R – Sl next st to cn and hold in back of work; k1 tbl, then k1 tbl from cn. TP2L – Sl next st to cn and hold in front of work; p1, then k1 tbl from cn. TP2R – Sl next st to cn and hold in back of work; k1 tbl, then p1 from cn. T2L – With the right-hand needle in back of the work, skip the first stitch on the left-hand needle and insert the tip of the needle into the back leg of the second stitch. Drop both of the stitches off of the left-hand needle. The first stitch will fall free. Insert the left needle into the dropped knit stitch, then slide the other stitch back onto the left needle. Knit the first stitch through the back loop, then knit the second stitch through the back loop. TP2L – With the right-hand needle in back of the work, skip the first stitch on the left-hand needle and insert the tip of the needle into the back leg of the second stitch. Drop both of the stitches off of the left-hand needle. The first stitch will fall free. Insert the left needle into the dropped knit stitch, then slide the other stitch back onto the left needle. Purl the first stitch, then knit the second stitch through the back loop. T2R – With the right-hand needle in front of the work, skip the first stitch on the left-hand needle and insert the tip of the needle into the second stitch purlwise. Drop both of the stitches off of the left needle. The first stitch will fall free. Insert the left needle into the dropped stitch, then slide the other stitch back onto the left needle. Knit the first stitch through the back loop, then knit the second stitch through the back loop. TP2R – With the right-hand needle in front of the work, skip the first stitch on the left-hand needle and insert the tip of the needle into the second stitch purlwise. Drop both of the stitches off of the left needle. The first stitch will fall free. Insert the left needle into the dropped stitch, then slide the other stitch back onto the left needle. Knit the first stitch through the back loop, then purl the second stitch. Using the long-tail method, CO 56[64, 72, 80] sts. Distribute sts across needles as you prefer and join for working in the round being careful not to twist. Right Sock Ribbing Round: (Work Right Rib Chart, working marked repeat 2[3, 4, 5] times) twice. Left Ribbing Round: (Work Left Rib Chart, working marked repeat 2[3, 4, 5] times) twice. Work appropriate Ribbing Round 18 times or until desired length. Note: The start of the round shifts over 6 stitches on round 12 of the chart – 6 stitches to the right for the Right Leg, and 6 stitches to the left for the Leg Leg. Right Leg Rounds 1–11: (Work Row 1–11 of Right Leg Chart; k8[12, 16, 20]) twice. Right Leg Round 12: Work Row 12 of Right Leg Chart; k8[12, 16, 20]; work Row 12 of Right Chart; k2[6, 10, 14]. This is the new start of round. Left Leg Rounds 1-11: (K8[12, 16, 20]; work Row 1–11 of Left Leg Chart) twice. Left Leg Round 12: (K8[12, 16, 20]; work Row 12 of Left Leg Chart) twice, K6. This is the new start of round. Repeat appropriate Leg Rounds 1–12 until desired length is reached, ending on round 12, including shift in start of round. Sample as shown has 6 repeats, and measures 7.5 inches long. 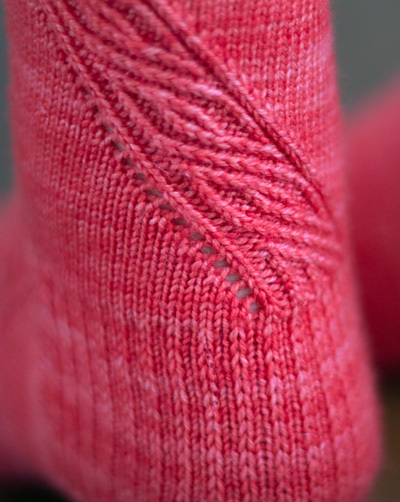 The heel flap is knit back and forth on a total of 28[32, 36, 40] stitches. Turn work so that wrong side is facing. Rem 28[32, 36, 40] stitches will be held for instep. Row 1 [WS]: Sl 1 wyif, p27[31, 35, 39], turn. Row 2 [RS]: [Sl 1 wyib, k1] 14[16, 18, 20] times, turn. 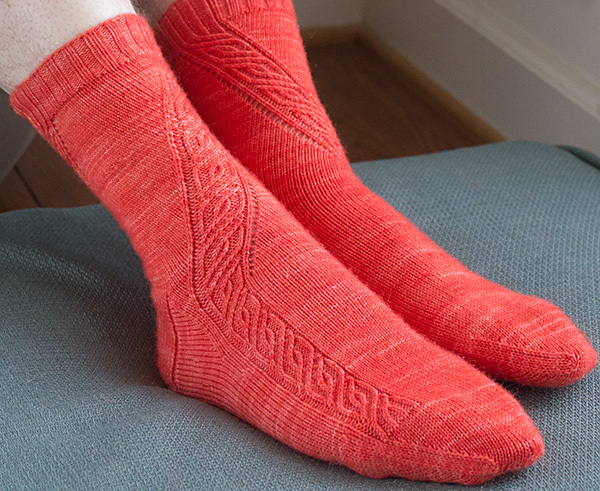 Repeat these 2 rows 13[15, 17, 19] more times for a total of 28[32, 36, 40] rows in the heel flap. Row 1 [WS]: Sl 1, p16[18, 20, 22], p2tog, p1, turn. Small Size Only: 18 sts rem. Proceed to Gusset. Medium Size Only: 20 sts rem. Proceed to Gusset. Large Size Only: 22 sts rem. Proceed to Gusset. Extra Large Size Only: 24 sts rem. Gusset Round 1, setup: With RS facing, pick up and knit 14[16, 18, 20] sts along the first side of the heel flap; work 28[32, 36, 40] instep sts in pattern as established; pick up and knit 14[16, 18, 20] sts along the second side of the heel flap, knit across heel sts and first set of gusset sts. This is the new start of round. 74[84, 94, 104] sts. Gusset Round 2: Work instep sts in pattern as established; k1, ssk, k to 3 sts before end of round, k2tog, k1. 2 sts decreased. Gusset Round 3: Work instep sts in pattern as established; k to end of round. Rep Gusset Rounds 2 and 3 4 times more, and work Gusset Round 2 once more to complete the final row of Leg Chart. 62[72, 82, 92] sts. At this point, you will start to work the Foot Chart in place of the Leg chart. 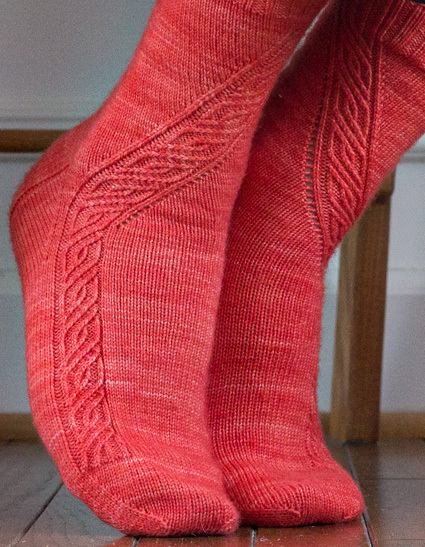 Gusset Round 13, Left Sock: K15[19, 23, 27]; work Left Foot Chart; k to end of round. 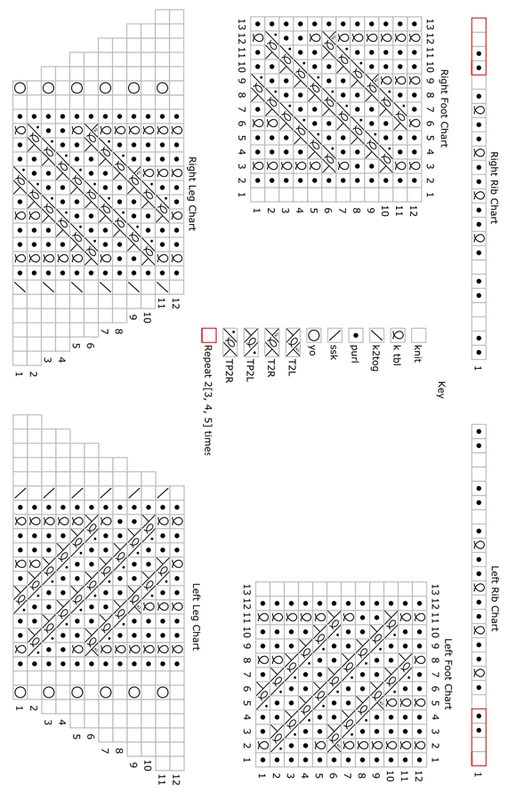 Gusset Round 14: K15[19, 23, 27]; work Left Foot Chart; k1, ssk, k to 3 sts before end of round, k2tog, k1. 2 sts decreased. Gusset Round 13, Right Sock: Work Right Foot Chart; k to end of round. 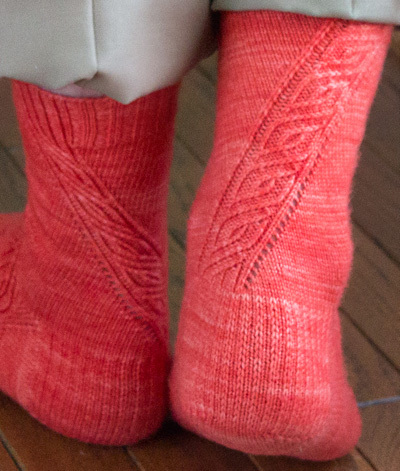 Gusset Round 14, Right Sock: Work Right Foot Chart; k15[19, 23, 27]; k1, ssk, k to 3 sts before end of round, k2tog, k1. 2 sts decreased. Rep Gusset Rounds 13 and 14 2[3, 4, 5] more times until 28[32, 36, 40] sts rem on the sole. Right Foot Round: Work Right Foot Chart; k to end of round. Left Foot Round: K15[19, 23, 27]; work Left Foot Chart; k to end of round. Work even as set until the foot is 1.5[1.5, 1.75, 2] inches short of full foot length ending after row 12 of the Chart. If necessary work additional rounds of row 12 of the Chart to achieve desired length. Round 1: K1, ssk, k until 3 stitches before end of instep, k2tog, k1; k1, ssk, k until 3 stitches before end of round, k2tog, k1. Repeat Rounds 1 and 2 6[7, 8, 9] more times until 28[32, 36, 40] total sts remain. Repeat Round 1 (decreasing every round) 3 times; 16[20, 24, 28] total sts remain. Cut the yarn leaving a 12-inch tail and graft the rem sts together. Weave in all ends. Rich started knitting as a way to relieve stress. His first two projects were sweaters, since there was no one to tell him that perhaps a scarf would be a better starting point. 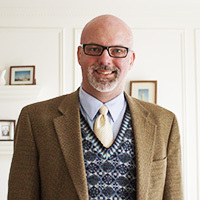 At some point, Rich got it into his shiny, bald head that knitting socks might be a good idea. Rich lives in Northern Virginia with four cats who think that stitch markers solely exist to entertain them. He can be found online here and on Ravelry.